SAN PEDRO, Ambergris Caye–Gabriel Salazar, 27, who classifies himself as a fisherman of San Juan, San Pedro, was remanded on Monday, September 8, to the Belize Central Prison until November 6, on a charge of murder. Police allege that Gabriel Salazar was the killer who shot and killed Rolando Espat, Jr., 23, of San Pedrito, San Pedro, at about 1:30 Saturday morning in San Pedrito while he was walking home after being at a club near his house. As Espat was about 50 feet from his home, a gunman came up to him and shot him several times, at close range. The gunman then ran away and boarded a boat, which sped away. Espat was declared dead on the scene. Police say that they saw him at the San Pedro clinic with two gunshot wounds in the chest, one in the left eye and one in the right upper thigh. Police launched a speedy investigation that led to Gabriel Salazar, who was found in the area, and he was taken into custody that same Friday night, about 30 minutes after Espat was murdered. Salazar was detained over the weekend and was taken to the San Pedro Magistrate’s Court on Monday, where he was arraigned on the charge of murder, and was remanded to the prison. Police believe that Espat was killed because of the ongoing drug war in San Pedro. According to the San Pedro Sun, Espat called his mother minutes before he was shot and told her that he was being followed. Espat also called his father and told him what was happening, and his father sent a man to accompany him home, but he was attacked and killed before the man could reach him. His mother said that Rolando is the third son she has lost due to violence. Her first son to be murdered was Charlie Espat, who was one of the two San Pedro residents found buried in a shallow grave about 50 yards off a feeder road in the Orange Walk District on June 9, 2012. The second of her sons to be killed was Byron Estrada, who was stabbed about 22 times inside a San Pedro club on Saturday, January 26 of last year. San Pedro police said that Rolando Espat, Jr., was no stranger to the law. Police say Rolando, his brothers and some associates are associated with one of two rival drug groups operating on northern Ambergris Caye. 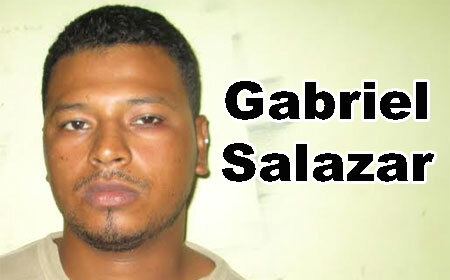 Gabriel Salazar is also no stranger to the law, and is known to the police. He was one of four men who were charged for the January 29, 2009 double murder of James Swan, Jr., and Eduardo Gutierrez, whose decomposing bodies were found in a shallow grave on northern Ambergris Caye. On May 30th, 2012, a jury found all four men, including Salazar, not guilty of the double murder. Salazar was also under investigation for the March 13, 2010 armed robbery of the Scotia Bank branch in Spanish Lookout, Cayo, after which he went on the run for months. He was found in San Pedro Sula, Honduras, where authorities there fatally shot Alex Edwards and Benjamin Peters and seriously wounded Salazar during a robbery attempt they allegedly made in that city. Salazar was returned to Belize to face trial for the robbery and murder of a security guard in Spanish Lookout, in connection with the bank robbery, but he was acquitted of the charges. Gabriel Salazar later walked away again from yet another murder trial, but this time at the Dangriga Supreme Court after he was acquitted of killing Francis Johnson, a store owner of Big Falls, in the Toledo district. The murder occurred during a violent armed holdup and robbery of the store on September 9, 2009, in which the store’s owner, Johnson, was shot and killed in the process. Salazar and three other men were suspected of committing the robbery that became murder, but the three men escaped and fled the country. Police said that their investigation led to Salazar, but he was on the run. When he was found in Honduras and returned to Belize, he was then taken to the Dangriga Supreme Court to stand trial for the death of Johnson. It was then that he told the court that he had been beaten by police and the judge disallowed the admission made by Salazar, implicating himself as the killer, and the case against him fell apart. Also, he was one of three men who were arrested and charged with robbery and conspiracy to commit robbery after they allegedly shot a businesswoman in the chest on July 4 and escaped with her bag containing about $70,000 worth of jewelry.